Having to recall a product can result in significant expense to replace the product, reimburse the customer for resulting loss of profits, and unfavorable publicity that negatively impacts your sales and reputation. A crucial component to financially surviving a recall is an aggressive action plan combined with an insurance policy to transfer some of the related expenses to. US Coast Guard: Marine vehicles and related products (e.g. boats, personal watercraft, life jackets). Consumer Product Safety Commission (CPSC): Consumer products (pose a fire, electrical, chemical, or mechanical hazard or can injure children). Environmental Protection Agency (EPA): Pesticides, fertilizers, and anything harmful to the environment. Administration Food and Drug (FDA): Food, pharmaceutical drugs, health supplements, cosmetics. United States Department of Agriculture (USDA): Meat, poultry, eggs. National Highway Traffic Safety Administration (NHTSA): On-road vehicles and related products (e.g. cars, trucks, vans, recreational vehicles, motorcycles, tires, motorcycle helmets, children’s safety seats). Manufacturer or dealer notifies the appropriate regulatory agency of their intention to recall a product (if not mandated). Consumer hotlines or other communication channels are established. The scope of the recall (serial numbers or batch numbers etc.) is specified. 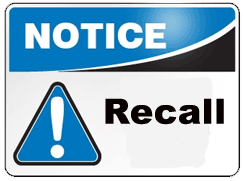 Product recall announcements are released on the respective government agency’s website (if applicable), as well as in paid notices in daily newspapers. When a consumer group learns of a recall it will also notify the public by various means. The consumer is advised to return the goods, regardless of condition, to the seller for a full refund or modification. If a product recall “could” happen in your business, the best time to plan for one, is now. prearranged procedures and fees for collection, storage retrofit, and/or disposal of recalled items. releases to the media so the situation is presented in a positive manner that will reduce negative perceptions. Since many parties will be involved in a recall–company departments, dealers, distributors, customers–the plan needs to be periodically reviewed to assure it remains effective and meeting all legal requirements. Coupled with your “Recall Action Plan,” Product Recall Insurance can put your business in the most favorable position to handle a recall as you can share the expense with the insurance carrier and utilize the carrier’s expertise in handling recall situations. Most product recall insurance programs include First Party Expenses and Third Party Liability. First Party Expenses can include cost associated with notifying customers, shipping cost, extra warehouse and storage expense, cost to dispose of the products, and the cost of extra personnel required to conduct the recall. Third Party Liability will cover your legal obligation to pay compensatory damages as well as 1) the recall expenses of any third party for recalling their product that incorporates your product including the cost to repair or replace such product; 2) business interruption losses of others resulting from the covered incident; 3) the cost to repair and rehabilitate brand reputation; and 4) the additional cost to purchase substitute goods to replace your products. Impaired Property Endorsement – Impaired property is a third party’s product that cannot be used or is less useful because it incorporates your component or ingredient that is known or thought to be deficient and can be restored by repair, replacement, adjustment or removal of your component or ingredient. Cost to Refund, Repair or Replace Endorsement – Amends First Party Expenses to include your cost to refund, repair or replace your product or products. Worldwide Coverage – Amends Coverage Territory to include all parts of the world, excluding any jurisdiction in which this policy may be prohibited by local laws, statute or regulation.